To help all Minnesota children become successful readers by the end of third grade. Minnesota Reading Corps demonstrates how service and science can accelerate improvement in both students and systems. By mobilizing the people power of AmeriCorps, Reading Corps provides evidence-based literacy interventions and data-based assessments to children from age three to grade three. Since 2003, Minnesota Reading Corps has provided early intervention services to over 125,000 age 3 – grade 3 students. 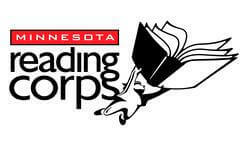 Annually, Minnesota Reading Corps reaches approximately 30,000 students.